Ford Europe released the latest on its redesigned Mondeo, which premiered in lights of lime during last year's Bond vehicle "Casino Real." It played an airport rental car, which won't necessarily different from the real European Mondeo. But the first manifestation of Ford Europe's "kinetic design" language is too well designed to be relegated to rental hell. It's debuting in Geneva in four-door, five-door and wagon models, ahead of sale this June. Brentwood, February 14, 2007: Ford has released the first images of the all-new Mondeo ahead of its world debut at the 2007 Geneva Motor Show. The dramatic all-new Mondeo is designed to raise customers' expectations for a car in this class through a combination of style, dynamics and technology. During its life, the Mondeo has appeared every year in the nation's top 10 favourite cars. A total of over four million Mondeo models have been built at the Genk plant since launch in 1993 with more than 1.5 million of those being sold in the UK. "The exciting new Mondeo is very important to us", said Roelant de Waard, Ford of Britain's Chairman and Managing Director. "It's probably the most elegant car we've ever launched, and it's certainly the most technologically-advanced. Like the S-MAX, Car of the Year 2007, the new Mondeo will attract many new customers to our showrooms as well as delighting our loyal UK customer base," he said. The new Mondeo is striking and unmistakably a member of the Ford family. It is the latest and most advanced expression of Ford's 'kinetic design'. The distinctive front end has chamfered corners and a deep offset between the top of the bonnet and the front wings. A muscular shoulder line runs through the side of the car to a high point at the rear. Distinctive rear lamps also feature carefully designed graphics that enhance the overall feeling of premium quality. A strong undercut line runs from the bold front wing wheel lips through the side of the car. Under this, full surfacing extends down to strong rocker panels to ensure the vehicle maintains a dynamic road presence. The spacious interior shares the same 'kinetic design' exterior language as the exterior. The driver will enjoy the 'cockpit' driving position as the higher beltline and flow-through centre console combine to enhance the cosseted feeling for front seat occupants. New levels of craftsmanship are evident throughout. For example, careful use of 'piano black' interior styling accents creates interest and a pleasing feel to key touch areas. Soft-touch material and ambient lighting is used extensively throughout the cabin to emphasise its quality and refinement. The Ford Mondeo range has always offered a wide choice for customers, and the new Mondeo is no exception. Standard equipment across the range includes Electronic Stability Programme (ESP), Ford Easyfuel capless refuelling with fuel inhibitor to prevent misfuelling, Thatcham Cat. 1 alarm, air conditioning, 'follow-me-home' lights, trip computer and an MP3 connector socket. Three distinct bodystyles - a classic four-door, a stylish and flexible five-door and the capacious Estate - will all be available from launch. For each body style, four distinct series are available: the Edge, which provides a high level of standard equipment essential for business and family needs; the contemporary Zetec series, and, at the top of the range, the Ghia and Titanium X models. These flagship models offer a choice of premium quality details. While the Ghia represents classic luxury, with extensive use of chrome and wood ornamentation inside, the Titanium model will appeal to those customers favouring a more contemporary, technology flavour. Advanced new driver-focused technologies are available, and include keyless entry and keyless start with "Ford Power" start button, new Ford "Convers+" Human Machine Interface (HMI) instrument display, Adaptive Cruise Control with Forward Alert, Interactive Vehicle Dynamics Control with Hill Launch Assist, and Tyre Pressure Monitoring System. Furthermore, this new Mondeo is the first production Ford to feature the company's award-winning Easyfuel system. This guards against either petrol or diesel misfuelling at the filling pump as the fuel filler neck aperture has been specifically designed around the different sizes of fuel nozzles. Ford has engineered its system only to allow the nozzle that matches the corresponding fuel type of the car to enter the filler neck. 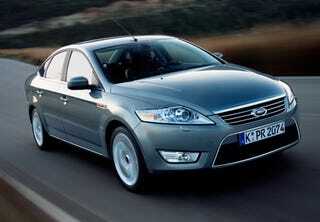 The Ford Mondeo has been acclaimed for its driving quality since its original introduction in 1993. The new Mondeo aims to extend this reputation even further, and from the outset was developed with superior driving dynamics as a core attribute, combining a refined ride with minimal noise, vibration and harshness. Ford has specified the trusted MacPherson front suspension system for the new Mondeo incorporating features to enhance the Mondeo driving experience such as isolated subframes, control arm hydro bushings, S-shaped springs and dual path strut mounts. At the rear a new version of the proven multi-link rear suspension design also benefits from an isolated subframe mounting system. This concept is already familiar in the Ford S-MAX "Control Blade" design and uses four links to control each wheel precisely. New Mondeo promotes stress-free, relaxed driving through low noise levels which enables easy communication inside the vehicle and optimum use of the internal audio equipment even at high speeds. The combined effect of all the engineering actions, in terms of noise, is a reduction of 3dB across the whole frequency range, compared with the current model. Wind noise, measured in Ford's state-of-the-art aero-acoustic wind tunnel is the lowest in its class, and reinforces the quality ambience of the interior. 1.8-litre Duratorq TDCi 100PS or 125PS diesel with 5-speed manual transmission. The 125PS version can also be specified with a 6-speed manual transmission. 2.0-litre Duratorq TDCi 140PS diesel with 6-speed manual transmission. 1.6-litre Duratec Ti-VCT 110PS or 125PS petrol engines with 5-speed manual transmission. 2.0-litre Duratec HE 145PS petrol engine with Durashift 5-speed manual transmission. Range topping, performance-orientated 2.5 litre Duratec 5-cylinder 220PS petrol engine with Durashift 6-speed manual transmission.